Oops! I didn't quite make it up for the start of the 160 km New Zealand National Championships. 44 riders started the 160 km at 1 AM, and 11 Juniors/Youths started the 120 km at 4 AM. It was a chilly morning when I got out on the grounds at 7 AM. There was a frost, but clear, no clouds. It was too cold for the strappers to be too busy for the first part of the morning, but as the day warmed up, they got busier. And of course you don't want to put too much cool water on the horse, or in the wrong places, such as the back and hip, where it might cause them to cramp up. You do put lots of water on over the head and neck and shoulders, and scrape it right off. Cool water under the hind legs, then more over the neck and scrape it off. I haven't seen anybody riding with rump rugs here, though Trevor said a few people do. Most people I've watched give electrolytes in feed, as well as dosing at the beginning of every loop (as long as the horse is drinking). The strappers also clean tack after every loop (um, I clean my tack well about once a year). Jo, who straps for Paul Jeffrey is always busy with the horses and gear, never stops working. 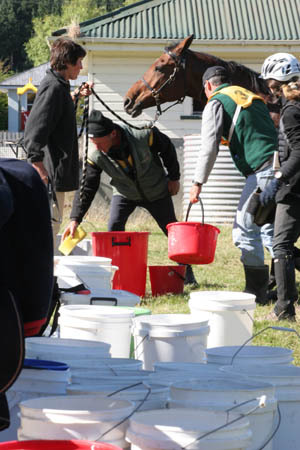 The strappers also provide the rider with food and drinks, keep the horse supplied with food, blankets if needed, and carry the tack back and forth. As the day went along, the same 4 or 5 riders stayed up front setting a quick pace, including Kylie Avery, who on her stallion Silands Jasark won the Horse of the Year ride. The Juniors were clipping right along in their 120 km ride - here they don't ride with sponsors - and to me they look pretty fearless. There were 6 loops; loop 1 at 30 km was done twice (in the dark); loop 2 at 30 km was done twice; loop 3 was 20 km, and loop 4 20 km. There was a 40 minute hold each loop, with 10 extra minutes added to the hold times of I think the 4th and 5th loops for a represent of the horse just before going out. All those loops and hold times are a far cry from the 100 mile rides I know, with maybe 3 vet checks spread out among 3 30+ mile loops, or a 65-mile and a 35-mile loop. But FEI rules require 6 loops with these shorter hold times. Doesn't give the horse much of a good rest, and, I believe it removes some of the horsemanship from the ride. I'm not saying it's good or bad. 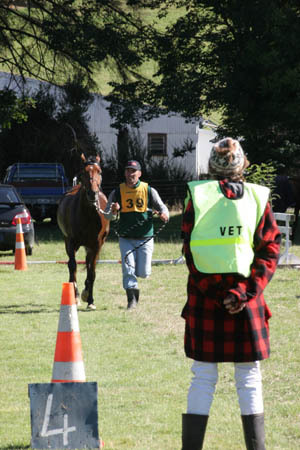 If you can go out and gallop 30 km, have a break, go out and gallop 20 km and have a break, etc, you can do just that - gallop along, slowing near the vet checks for your heartrate and letting your strapping crew take over to get your horse down. That would be a different way or riding than if you had a 60 km loop where you had to manage and ride your horse a bit differently, to get him along further, rate him with a bigger plan in mind before he could have a break. Just an observation. Lois Hosking and her chestnut Highlander, the Best Condition winners at Horse of the Year, vetted out (pulled) after the 4th loop for lameness. Well, he's still the handsomest horse on the grounds. Linda Pullar's horse Razzy was going very well for Linda Meredith (Razzy's first 160 km), and Vanzant was going well for Sandie, as was Gemstone and Paul Jeffrey. Just after 3 PM the winner Mark Tylee came across the line first on his mare Class Act, with the next 3 finishers within 2 minutes of him, including Kylie on her stallion who came 4th. An hour later in 8th place was last year's National Champion, Jenny Champion on Freckles, and a minute after her was Linda Meredith on Razzy. We watched Razzy vet through - well, I don't know if Linda Meredith watched her: "The last vet out is always too hard to watch!" But Razzy passed with flying colors, and there were happy hugs all around. Sandie and Vanzant went out on their last 20 km loop just as it was getting dark. They kept company with 2 other riders, Robyn Peters, and Mariaan Liversage from South Africa. 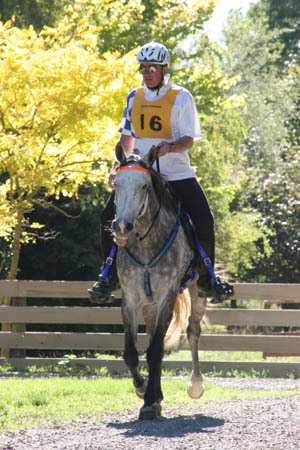 Her husband Leon is a saddlemaker, and would donate a saddle to the Best Conditioned winner of the 160 km. At about 8:15 PM the announcer broadcast the riders had just passed the checkpoint and were less than 5 minutes from home. "Everybody come out and cheer for them!" A good-sized group of people gathered 'round the finish line and waited for sight of bobbing headlights to turn the corner into camp. There they came, and a big cheer went up, clapping and whistling and yelling (which spooked the horses) for the last 3 riders home. A completion for all of them, Sandie and Vanzant's first 160 km ride! 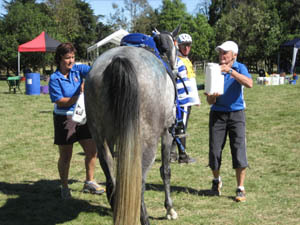 Their ride time was 15 hrs 32 minutes (not including vet holds) - less than 30 minutes off the cut-off time. In most New Zealand 160 km rides, you have only 16 hours (ride time) to complete the ride. It's the Organizing Committees of the rides (the rides are put on by riding clubs) who make this pretty standard rule, because they figure you really don't need to be out there for 24 hours, and if you do, the ride is really too difficult. Consensus from the riders was that it was a fairly tough ride, plenty of hills to climb. Paul Jeffrey said according to his GPS information, there was 3650 METERS of climbing in the 160 km ride. 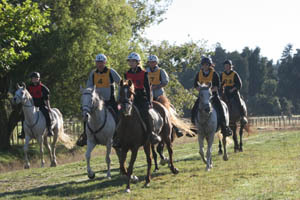 Garry Walker, president of the Ruahine riding club that put on the ride had said the ride has "undulating hills and flats." Paul told him "I must have taken a wrong turn because I never found the undulating hills!" Of the 44 starters, there were 26 finishers and 18 vet-outs (pulls). Of the 11 starters in the Junior-Youth 120 km ride, 8 finished. Natalie Bickerton finished with a 7 hr 34 minute ride time, 4 minutes ahead of Tessa Deuss. Two big rides down, more rides to come!